There’s no doubt that the 2019 Alfa Romeo Giulia is not only one of the most popular new Alfa Romeo models, but also one of the most sought-after new luxury/sport sedans available today. Since its release, we’ve gone over and covered practically every inch of the 2019 Alfa Romeo Giulia from its design to its engine to its features and more. But there’s still one thing left drivers need to know about the 2019 Alfa Romeo Giulia, how does it stand against the competition? That’s what we’re going to find out in our latest model comparison page that sees the 2019 Alfa Romeo Giulia take on the popular 2019 Chrysler 300. Which four-door luxury sedan has more to offer drivers? That’s what we’re about to find out! We’re going to compare the base trims of both models in a variety of categories to see which one is the superior model. Let’s see who comes out on top! 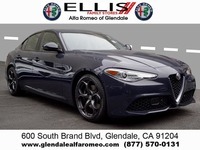 Test Drive the 2019 Alfa Romeo Giulia at Glendale Alfa Romeo in Glendale, California, Today! No matter which sedan wins in this comparison, it’s safe to say that both the 2019 Alfa Romeo Giulia and 2019 Chrysler 300 have acquitted themselves well with impressive measurements and specifications in the categories drivers most care about like performance and efficiency. With that being said, when you look at the key specifics of both models, side-by-side, it’s clear that the 2019 Alfa Romeo Giulia has more to offer drivers than the 2019 Chrysler 300. With both models being known for their sporty engines and top-of-the-line performance, it only makes sense to begin our comparison by looking at the engines for both. The 2019 Alfa Romeo Giulia sports a 2.0-liter Inline-4 engine while the 2019 Chrysler 300 offers a 3.6-liter V6. Despite the 2019 Chrysler 300 having a bigger engine, the 2019 Alfa Romeo Giulia shows it has more to offer in terms of performance with a stronger combination of horsepower and torque, leading it to a faster zero-to-60 MPH time. Sometimes, big things come in small packages! As if that weren’t enough, the 2019 Alfa Romeo Giulia also outdoes the 2019 Chrysler 300 when it comes to fuel efficiency. Thanks to the fine-tuning of the engine, smooth transmission and aerodynamic design, the 2019 Alfa Romeo Giulia has a much better combined fuel economy than the 2019 Chrysler 300, showing that drivers don’t have to choose between performance and efficiency! Want to learn more about the 2019 Alfa Romeo Giulia? Contact our staff at Alfa Romeo of Glendale for more information or to schedule a test drive today! Interested in a Alfa Romeo Giulia?